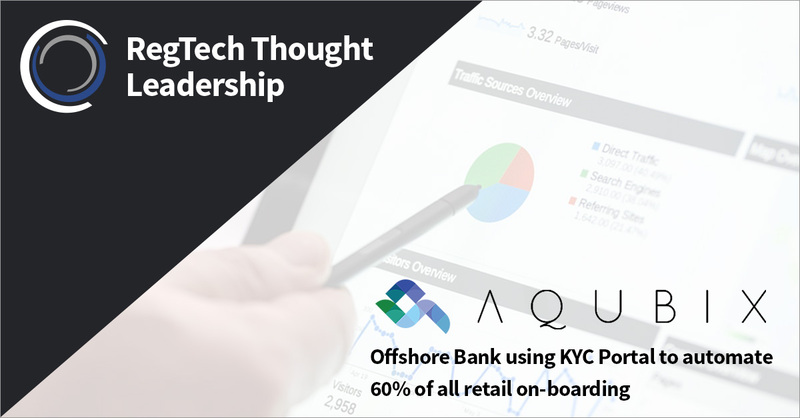 Aqubix’s KYC Portal has revealed an unnamed offshore bank has deployed its KYC and due diligence solution to automate 60 per cent of its retail onboarding processes. Whilst the majority of banks are improving onboarding experiences for retail customers, most of the effort is focused on the client-facing side. Although consumers are faced with a streamlined process, there is a backlog in the operational side of maintaining the constant flow of customers. KYC Portal’s new client wanted to streamline the flow of onboarding retail customers on the client side, but also automate the operational processes. The project took six months to complete and allows the offshore bank to ease customer onboarding without adding extra workloads to compliance teams. When undergoing the task, KYC Portal began by having a dedicated workshop with the bank’s operational, compliance, IT, and businesses processing teams. The new automated solution would impact a variety of areas in the bank and it was important to discuss with these teams what sectors would be needed for the overall project to work. The RegTech 100 company has released a case study on how it was able to help the bank achieve these high-levels of automation. This was an integral part of the project whereby a specific custom on-boarding solution was built and designed in line with the brand requirements of the bank. A customer facing web portal that allows the potential retail customer to input their respective details. A stepped approach that is accessible via any web interface and also fully responsive for mobile devices. This module guides the user into what needs to be done and filled. Based on the data being populated the system will prepare the required banking documentation which is automatically pre-populated with the client’s data. These documents are presented to the user to be able to review and sign-off. KYCP has been integrated with a third party called HelloSign so that throughout the same interface the client can digitally sign the respective documents. Next step in this process is the online verification, for which we integrated the system with Jumio. The customers present their identification documents (e.g. driver’s license or passport) and verify themselves through a very neat user experience. The user is then guided to the final step which is that of checking all the details and submitting the application. Once the application is submitted, the above custom on-boarding solution transfers all the data to KYC Portal as a new application through the authenticated API of KYCP. The application is received with all the data that the user submitted including the digitally signed forms, the audited verification from Jumio as well as all the identification documents. Once the application is in KYC Portal, the risk is automatically calculated in real time based on the configuration that the bank have defined. KYCP allows for all the regulatory process to be tweaked based on their requirements, which configuration came as a result of the workshops between the respective teams. KYC Portal has also been integrated with ComplyAdvantage to be able to check if there are any matches on PEPs, Sanctions and Adverse Media on the client. Within a matter of minutes, KYC Portal has an entire picture of all that needs to be known to allow an agent within the compliance team to be able to take a decision. However, this bank took it a step further and used the embedded workflow engine of KYCP to automate the decision-making process too. Using the rules engine in KYCP, they configured the system to be able to process decisions in an automated way. One of the aspects that increased efficiencies with this approach was the approval of low risk customers. They set KYCP in a way that if a customer has been successfully verified by Jumio, the risk is green (low), the expected documents are signed and there are no matches from ComplyAdvantage then the respective customer is set to APPROVED without any human intervention. The bank has also opted for the real time transaction monitoring engine of KYCP. Thanks to the unique identifier of any customer being on-boarded this engine is constantly checking for any anomalies that the AML team would need to be alerted on in real time. This engine will alert KYCP directly when such anomalies happen and update specific data on a subject which in turn can have a repercussion on risk in an automated manner. This entire system has been integrated with the bank’s digital core banking solution Mbanq. The integration further automates processes and instantly benefits low-risk customer on-boarding (which is usually 60% to 70% of the entire customer base) through strongly reducing the time of opening an account. Mbanq has uniquely designed its technology to seamlessly open the account for any APPROVED customer from KYC Portal whilst significantly decreasing manual procedures. As one can see from the above description of this specific use case, this project required integrating with various third parties all of which have excellent technologies in their own right and all of which have APIs to allow for more secured and defined integrations. All the parties have been selected by the bank to deliver this overall project. This offshore Bank has embarked on a challenging yet innovative project that is fully focused on offering a smooth on-boarding experience for their retail customers and a solution to streamline the back-office and operational challenges on maintaining such customer relationships going forward. A system that is focused on reducing risk and cost on all subjects. Get your tickets before prices go up! Would you like a FREE RegTech Investment Summary report? Leave your email and we will send it over!